BPS Research Digest: Would you walk past a money tree? Would you walk past a money tree? We're oblivious to a lot of what passes in front of our eyes. The classic example is people's failure to notice a woman walk through a scene in a gorilla suit. In that study, observers were busy counting basketball passes between players so the gorilla was irrelevant to what they were doing. In a new paper, Ira Hyman and his colleagues say they've extended this phenomenon of "inattentional blindness" by showing that people are frequently blind even to objects that are relevant to what they're doing. For instance people can register a tree enough to avoid it, but not be aware of what they've avoided. Even if the tree contains money. 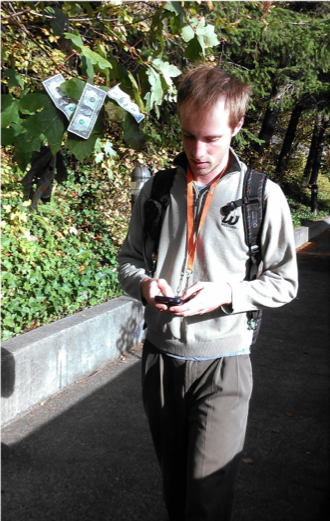 Inspired by a YouTube video "The Money Tree" (see above), Hyman and his colleagues pinned three dollar notes to tree branches hanging over and obstructing a pathway on a university campus (see pic). Over two weeks, the researchers observed people walking down the path, noted whether they dodged the tree or not, and whether they spotted the money (they assumed that anyone who spotted the money would pause to take it or at least inspect it). Overall, 396 people were observed walking down the path (203 men). Only 12 of them walked into the tree branches. So most people registered the tree enough to guide themselves to safety. In contrast, only a minority of the walkers noticed the money - 6 per cent of those who were texting or talking on a mobile phone; 20 per cent of those who weren't using a phone. In an earlier study, the same research team erected a signboard on a university path, with the text "Psychology Research in Progress". Over two weeks, the researchers noted the behaviour of 141 pedestrians on the path, and 15 feet after the signboard, they interviewed them about what they had or hadn't seen. All pedestrians successfully navigated the board, yet only 63 per cent of those on a mobile phone knew afterwards that they'd passed a signboard, and 83 per cent of those not using a mobile. Even fewer were able to say what was written on the board. In other words, a large number of pedestrians were successfully guiding themselves around an object, of which moments later they appeared to be unaware. "People can use information about an object to guide behaviour without becoming aware of what the object is - a clear dissociation between the guidance of behaviour and awareness," the researchers said. They noted that those participants in the signboard study who left it to the last minute to dodge the sign (most often this was the mobile phone users), were even less likely to be aware of the sign when asked afterwards. Hyman and his team said their research provided real-world evidence supporting the theoretical notion that we have two visual streams in the brain: a ventral stream that sends information for conscious processing and object recognition; and a non-conscious dorsal stream that sends information to the parietal cortex for the guidance of movement (but see here). It's thanks to dorsal stream processing that people "can experience inattentional blindness for objects that guided behaviour," they said. But is this the correct interpretation? I was surprised the researchers didn't draw a distinction between peripheral and focal vision. Is it not possible that the pedestrians clocked the tree or the sign in their peripheral vision - enough to avoid these obstacles - but because they did not look at them directly, they did not gain enough information to identify what they'd avoided? This would be a case of people only extracting the information they need from the environment, rather than all information being extracted but only some reaching conscious awareness. Talking on a mobile phone, you're less likely to notice the unicycling clown. Psychologists destroy money for the sake of science. I sit left of movie screens and computer displays. I'm right handed. I've even tried forcing myself to sit centre of a PC display and it feels very weird. Gah! sorry ... corrected (again!). Thanks for being there! Why are people arguing over the subjective opinion of the article writer? Whether they used the phrase "begs the question" as to mean the answer is obvious does not matter because obviousness itself is subjective and not based on truth. Example:Which begs the question which came first the chicken or the egg? The begging of the question would be reffering to the fact that when asked about the "chicken and the egg" the percievabley obvious social question would be "which came first" not whether the answer to this specific question is obvious. And this too would still not be truly obvious as obviousness is theoretical not a true principle. In the case of the study what is obvious is that nobody knows or can prove nor disprove discernably the answer to the study in question so technically "it begs the question" is not incorrect people are just interpreting it incorrectly. Plus just to make a point obviousness is not based on truth because it is based on perception whether something is obvious or not does not prove its validity because what is obvious to one person is not to another. It was once obvious that the world was flat then later it was obvious that it was round honestly its still not obvious unless you are truely selfish and believe human knowledge is the very definition of truth itself. Also just to be clear even objectivity is subjective to an individuals personal judgement because judgement itself is largely based on an individuals emotional feelings. Say you were asked "If you could give someone an imaginary penny worth absolutely nothing for absolutely nothing including putting no effort forth to give it to the person would you do it or not?" I mean you would think this would be an objective decision because it makes absolutely no difference either way to you or the other person so you would think no emotional involvement would be involved but to even ponder the question is puting some kind of emotional involvement into the decision to pick between yes or no. Interesting, though already Prof. Vrij and Mann got such a result really. I cannot remember the full reference, just that I found it in a review.